I redrew some panels of Celephais page 10 for the graphic novel edition. You can see the original version here, but I was never really satisfied with it and I’m glad I had time to redraw it. Perhaps the new version telegraphs the ending a little more, and certainly the mood is different, but I like it. Ultimately the change was made for layout/balance reasons. Wow!! I didn’t see any problems with the original image, but I like this one better. And I like the huge change in mood and meaning that is caused by it. This is some of your better work. It would be neat if you had a “behind the scenes” section somewhere in the book to show some of these alternate versions, though I fully understand if space or other concerns preclude such a thing (not everyone likes watching the “extra features” on DVD, as they take out some of the magic of the story). If anything, these two versions are a great example of how enormously the illustration of the same text can influence its meaning… and move around the emotional beats of a story. This new version… it is haunting rather than joyful. Still somewhat hopeful. But perhaps most significantly, it is much more closely tied to Kuranes’ psychological state leading up to that point. 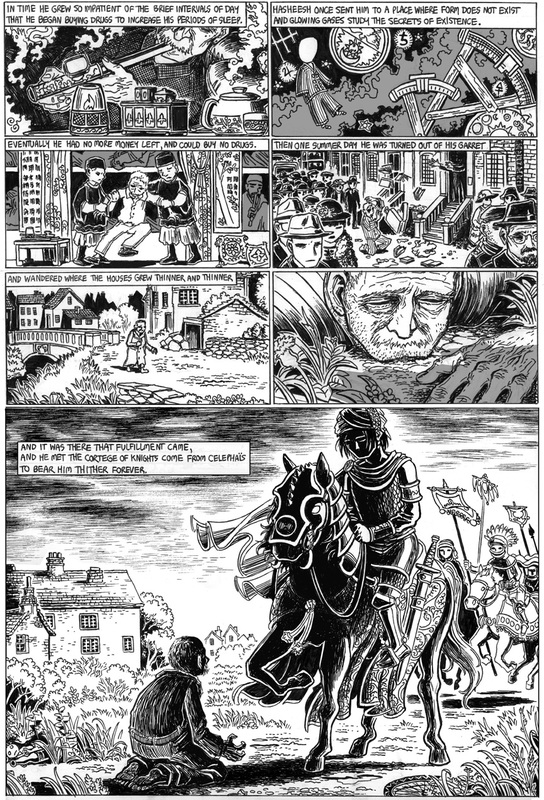 There is a direct emotional connection between the kneeling Kuranes and the dark solitary horseman standing over him that is missing in the first version, in which those wonderful, smiling, healthy figures seem to come suddenly out of fantasy and don’t seem like they can be part of the same world as Kuranes. The break between Kuranes’ “real” world and his dream-self (on the next page) is made starker here, as the darkness instantly vanishes as soon as he perceives himself as his dream-self. 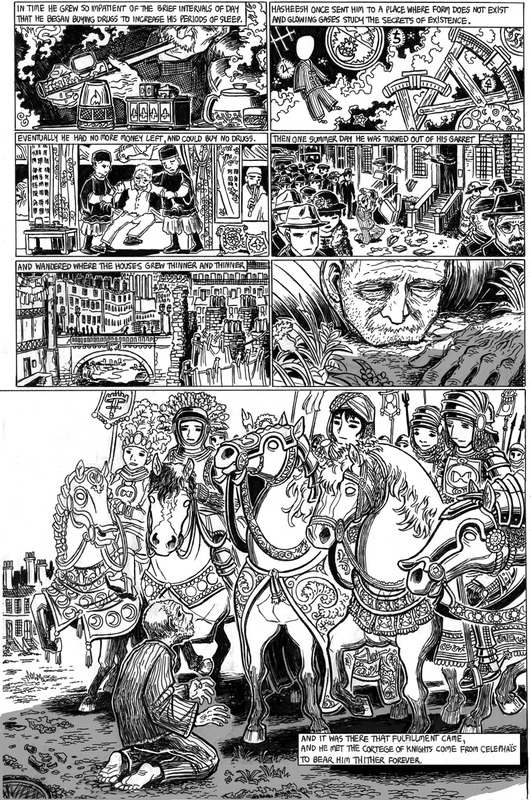 There’s even a hint that perhaps the horseman on this page actually represents something dark about to happen in the real world (an attack on a homeless man by someone on horseback? ), but Kuranes refuses to see it as such and instead willfully turns it into the cortege of knights from Celephais in his mind, thus “freeing” himself from the world in one sense. All sorts of potential associations are made possible.